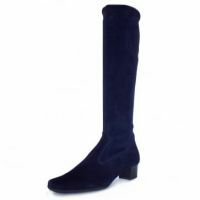 SUBLIME smart casual boots for narrow calves. They look a whole lot better on the leg than in the photo. Perfect to pair with skirts and dresses. Beautifully made and extremely comfortable. Refined, sleek and classic, and with an on trend snip toe. Great low heel. I bought these in INK BLUE in London, and can't be happier with them. They come in black, blue, grey and brown too. Velvet trend: Are you loving it or hating it?